Shapes and Numbers/ Math - Fizz Boom Read! For pre-readers, letters, numbers, and shapes are just nameless squiggles and angles without much meaning, yet they are encountered every day. While recognizing letters is so important to the beginning stages of reading readiness, numbers and shapes hold a crucial place in total literacy. Understanding the difference between "R", "3", and a square and that each of these forms holds a different meaning is a big step for someone just setting out on the path to reading. One early literacy skill to emphasize in these programs is print awareness. Sorting: Provide shape sorters and nesting cups for children and caregivers to play with. Sorting: Provide a container of large buttons, plastic letters, rocks, shells, or other items in a variety of colors, materials, or textures. Invite caregivers and children to sort them onto paper plates by color, material, form, or texture. Measuring: For older children, set out rulers and yard sticks and invite caregivers and children to measure things in the library. 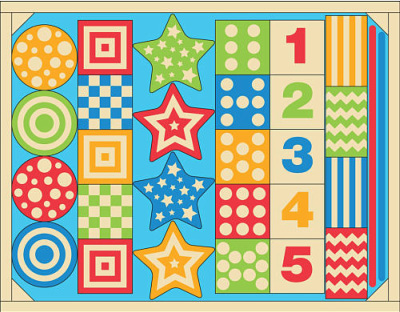 Counting: For older children, tape the numbers 1 through 5 on a table top. Place items on the table in those amounts. (1 car, 2 spoons, etc.) Mix the items up and encourage children to group them with the corresponding number. 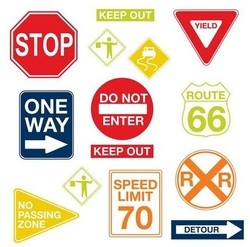 *Print off and laminate (if possible) a variety of common street signs. Then make corresponding silhouettes of the same shapes (a Yield sign and a triangle, for instance). Affix Velcro or a magnet to the back to use with your flannel board or magnet board and have the children match the silhouette to the street sign. Talk about how the signs you see every day are also shapes! This is a good chant to bounce or to step around the room to for caregivers and infants. On "blast off," encourage parents to lift their babies up in the air and catch them up again. Toddlers will love marching and jumping to blast off! 5, 4, 3, 2, 1 -- BLAST OFF! There is a section in the Early Literacy manual that suggests you give toddlers or preschoolers Tangrams to play with. I love Tangrams, don't get me wrong. I have a Tangram app on my iPod. My problem with this suggestion is, I, at 33 years old, get stuck sometimes trying to match the image. I gave Tangrams to my school-aged kids 3 years ago for "One World, Many Stories" and some of them had trouble. I think this would be a great addition to a school-aged program, a bulletin board challenge, or just set up as a free play station somewhere in your library. I do not, however, think it is an appropriate Early Literacy game. 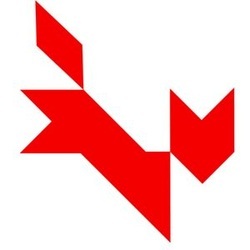 Taking an abstract image like this fox shown at the left and expecting young children to be able to conceptualize how seven shapes can fit together to make that form is unreasonable. Their brains are not yet capable of that level of higher thinking. The only way you may be able to get away with it is to offer the children a color-coded solution and have the seven shapes colored to match. But then you run into dexterity issues, as it's not easy for young children to complete homemade puzzles and if the shapes don't line up just right, the image is lost. They're not going to get it and if they respond at all, it will be either to do their own thing, or with frustration.Just FYI.